We all know that decorative pillow covers are an inexpensive way to change-up your space on a budget but what about when you are in a hurry? Like guests are coming in half an hour hurry! Allow me to introduce the envelope pillow cover. For this easy envelope pillow cover we are going to fold one long piece of fabric to create the front and back. The ends will overlap approximately 3″ at the back when finished. This extra fabric is to ensure that the pillow form will be hidden when the pillow cover is in place. 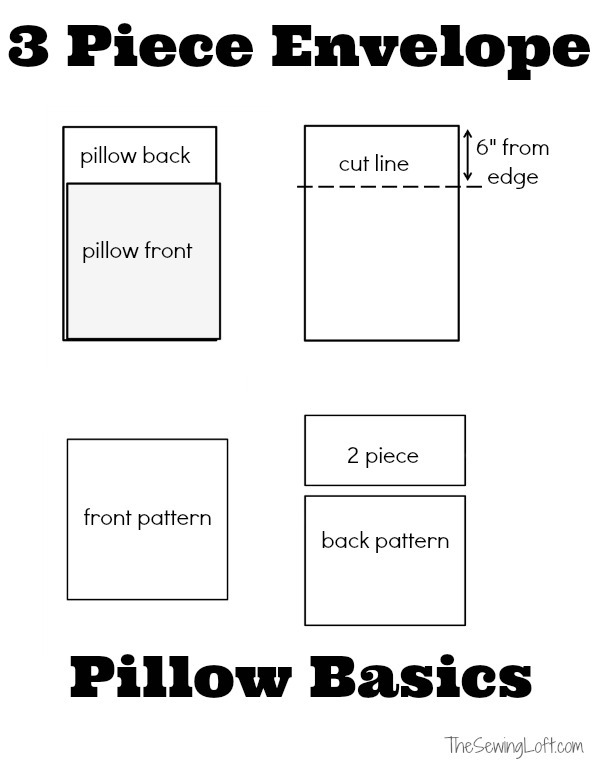 To calculate the fabric measurement you will need measure your pillow insert. Double this number (front & back) and to add 6″ for overlap and hem. Add 1/2″ top and bottom for seam allowance. Example: Cut your fabric 38″ long x 17″ high to cover a 16″ square form. To create a hem, fold over the edge 1/4″ and press. Fold over the same edge a second time, press and straight stitch with matching thread. Lay fabric wrong side down and fold the left and right sides over to create a square. Position overlap as desired. Pin seam allowance in place. Stitch along top and bottom seams with 1/2″ seam allowance, press. Turn pillow cover right side out and insert your pillow form. Toss on the nearest comfy chair or cozy couch for an instant change. 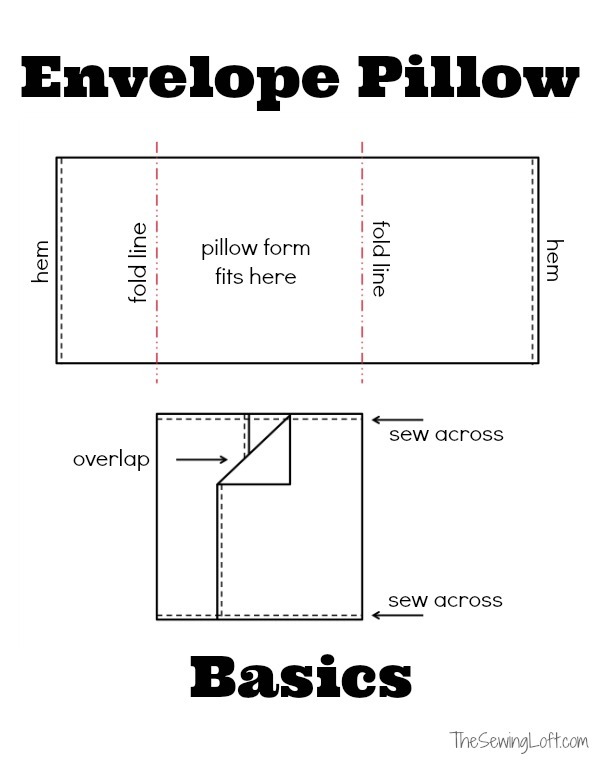 The fold over method is just one way of making an envelope pillow cover and only works for non directional prints. If you have a directional print or fabric with a nap like cuddle™, you will need to cut the front and back separately. The pillow cover would be cut in three pieces and would look like the image below. Overall, the construction is basically the same with the addition of sewing the two additional seams. I would also add in clipping the corners to prevent any access bulk. Choose the envelope pillow cover that best suits your fabric but either way, it can be stitched together in a flash! Even in time for that last-minute guest. Decorative Pillows are a very easy way to jazz up your space. They come in all sorts of shapes, sizes, colors and price points. But don’t let the price tags scare you off. With a few simple stitches you can create your own decorative pillows that will have your space up to date with all the latest trends. 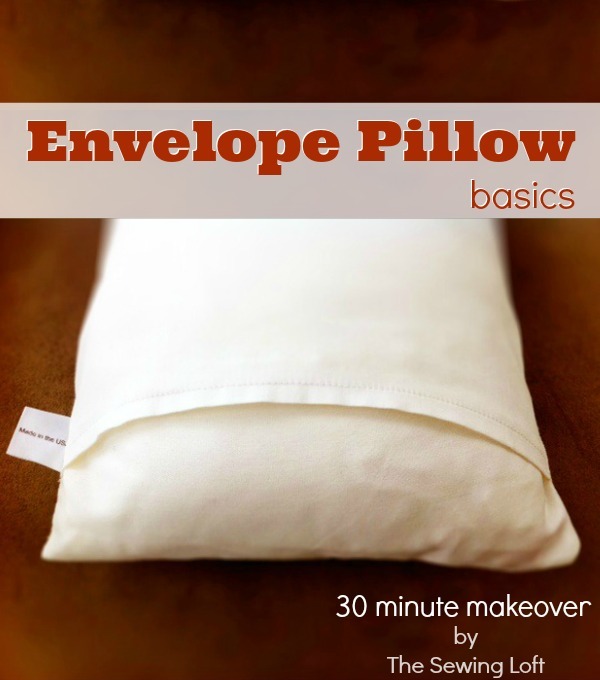 Thanks for the tutorial on the envelope pillow cover. How much do you like to overlap? I made some about 2 months ago but didn’t overlap enough so it gaps in the back. Is 6″ pretty standard? I like to give a good overlap size to avoid seeing the inside pillow form. Can you tell me what program you use to draw your diagrams? It makes so simple to understand!! Thanks so much. I’m so glad you like them Barbra. I draw most of them in Word. I just use the standard drawing tool. It is really easy. Getting in late on this, but I just stitched up two of the envelope pillows and it was a snap. Your instructions were very clear and easy to follow. I have sewing experience, but needed to complete this project quickly for a Make-A-Wish gift and this was perfect. Thanks! How awesome that, thanks so much for the sweet note Terri! I love envelope pillows but can’t get rid of those “dog eads” in the corners. I have e tried many techniques and they don’t work, suggestions are welcomed. I used the single piece pattern to use up some extra fabric I had. I am a total novice when it comes to sewing, it’s only my second project but I’m so thrilled with how they turned out! Thanks for such a useful post! Thanks for this! The instructions were very easy to follow. Thank you! I finished my first paper piecing project, but didn’t know what to do with it. Wonderful Amy! So glad you found the article helpful.